It’s easy to get distracted this time of year, and particularly this week, with national holidays in the U.S. and Canada. So in the spirit of taking a midsummer break from work, here’s a completely off-topic post. We were cleaning out a storage area in our basement helping an older friend clean out his basement recently when we came across a box of old computer parts, cables, and software from my early days in engineering documentation early in his career. These photos may bring back memories for anyone who can recall when the 286 (for those under 30: that’s the Intel chip that preceded the 386, which preceded the 486, which preceded the Pentium, which preceded the Core i7 possibly powering your laptop today) was considered fast. Diskettes gave way to CDs, which made installation faster and easier. Here’s the CD for Microsoft Office. Not Office 1.5, or 3.0, or 95, or XP, or 2013–just Office. The great leap from DOS to Windows was that one could use a mouse. The original wasn’t cordless, or IR, or ergonomically correct, but IBM nevertheless sold a zillion of these. Finally, there’s this: an anti-static wrist strap. When installing circuit boards or memory chips, or doing any other kind of word on the inside of older PCs, one had to wear one of these things clipped to the computer chassis in order to avoid damaging sensitive components with static electricity. These are no longer required. Have a great holiday / Canada Day / 4th of July! This post was originally published on the WebMarketCentral blog on July 2, 2007. Since almost no one is working this week (other than me), the WebMarketCentral blog will take a break from web marketing coverage as well, to showcase one of my other activities: ongoing construction of a tree house, or more accurately, a “tree deck,” for the kids. It started innocently enough in the summer of 2005 as a small platform up in a tree, reachable only by rope at first, though a ladder was soon added. 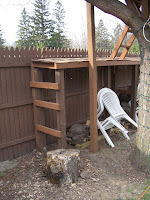 In 2006, the kids and I decided the tree deck was a bit cramped, and needed a second level. But first, I needed a scaffold of some sort to enable me to reach the higher level. I also needed some kind of shelter for our firewood to keep the rain off it. Left photo: the wood hut is constructed, but a mess. Below right: still a mess, but a ladder is added. Left: wood hut is cleaned up, but still no wood. Below: after five hours of quality time with a 20-ton log splitter and another five hours of stacking, the wood hut is finally complete. With my “scaffold” in place, I set to work on an upper deck which wrapped around three sides of the original platform. As this corner shows, my carpentry skills were improving. Here’s the tree deck in the bleakness of early spring 2007. It’s okay, but—it looks a little bare without a top. The kids decided the tree deck needed a roof. The first step was to get the frame in place. Wired with 10 strings of white Christmas lights, the tree deck really shines (literally) at night, though it’s difficult to capture the true look in a photograph. Hope your summer is fun and constructive as well.